One of Hannah's favourite things is to go to shows. I was once told by another mom that watching Hannah dance in the aisle was worth the price of admission for her alone. So I knew she would be a fan of Mystic Drumz. Mystic Drumz has been performing shows, delivering programs, and facilitating workshops for over 15 years. With over 5,000 events and counting, their one of a kind “World Music Safari Adventures” are a sensation in music education. This 55-minute world music safari adventure features music from around the globe takes viewers from the giant gongs of China to the talking drums of Africa and even into outer space. The show features high tech screen projections, incredible sound effects and unique instruments from around the world. We got to review a sneak peak of the DVD and Hannah LOVED it. She stood up and followed the action just like she was at the show herself. You can purchase tickets online. Come join the fun on this fabulous musical adventure to find Marshmallow Island. Meet all the hilarious characters who colour the show with a splash of silly. One lucky YYZ Bambina reader will win a family pack of tickets to the Release Party as well as a copy of the DVD (please note, transportation is not included). Enter using the Rafflecopter below by May 19th, 2015. Disclosure: I received a copy of the DVD for the purpose of this review. As always, opinions on my blog are my own. My son loves music especially drums. 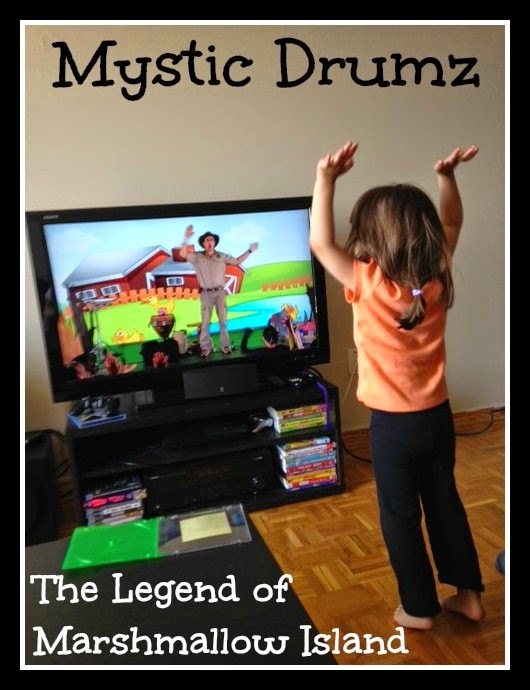 I love that the DVD incorporates animation with live music and gets The Kids up and moving.